Renewable, or ‘green’ energy is generated from natural resources like the sun, wind and water, so they are restored and never run out – unlike fossil fuels. The government’s Department for Business, Energy and Industrial Strategy (BEIS) has published projections on costs for projects starting in 2020. The estimates by BEIS show that it will cost £63 to generate a megawatt hour of electricity using onshore wind energy, reinforcing Caroline Lucas’s claim. It’s the cheapest renewable power source listed, in comparison with £106 for offshore wind. I don’t have an issue with the claim that onshore wind is the cheapest renewable source. Not that that is saying an awful lot! Thanks Paul for confirming the fact that nobody should believe anything coming from the BBC “Reality Check team”. There exists such a thing? Listen to Radio 4 programme “PM” (if you have strong stomach. They have a Brexit “Reality Check team” spreading Project Fear. Given that the BBC doesn’t understand the reality, I suspect their team will actually be underplaying the effects of the much loved by some ‘no deal’ Brexit. It’s BBC’s fake news again. The BBC doesn’t care as it extorts it’s money under threat of criminal prosecution so can make whatever nonsense claims it wants. ME – having to defend the BBC – well not really but they don’t extort money. It is OPTIONAL – you can stop paying as can anyone else. Extortion involves kneecaps I think. Oh and you can still watch as many moving pictures as you want, and it’s cheaper. What’s not to like. You cant watch the shyte on BBC but is that a loss. They use Crapita to extort the money but the truth is most people incriminate themselves by having a TV so big you can watch from the other side of the road – anyone see the pic in the press of a crowd in the street watching the World Cup semi on somebody’s big TV? – and with the curtains wide open so the muppet who calls can see it. Kind of undermines their defence. There is the REAL cost and the government manipulated purported cost and never the twain shall meet. Remove subsidies and reality emerges as indicated in the investment projections. Meanwhile the BBC puffs up the neurotic pronouncements of the Greenblob. “How to Lie with Statistics” should be mandatory reading. Onshore installations continue in poor Scotland and offshore burgens. Onshore wind no longer get subsidies. The probblem is the uk government have been blocking the route to market for onshore wind. Gerry. Why is it expensive English offshore wind generation and expensive English nuclear are both heavily subsidised but there is no subsidies for Scottish onshore wind which is far cheaper than both. 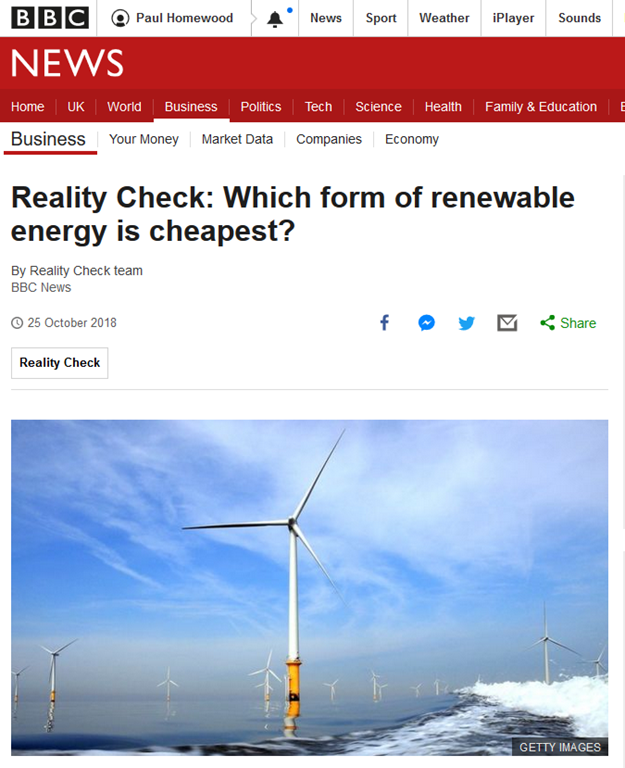 I think the BBC think that “accounting for intermittency” means take account of the expected average capacity factor in deriving a levelised cost, rather than assuming that the turbine will be generating continuously at full output. The costs of locating it in the Scottish Highlands when the demand is in London, or of supplying power when the wind drops do not figure in their tiny minds. Non-renewables economics require that they must have a large share of the customer demand to be profitable, ‘renewables’ do not have this constraint on them. ‘Renewable’ incentives (tax credits, subsidies, regional and local incentives, etc.) plus the ‘renewables’ have the luxury of preferential generation type selection (if ‘renewables’ are available usually they’re put on grid, others must reduce or remove themselves from the grid) have skewed the market. ‘Renewable’ generation has no effective penalty for not providing ‘on demand’ generation and little financial loss when oversupplying. In contrast if non-renewables were doing this they would be heavily penalized for such an outcome, and they would lose revenue for non-supply. This automatically means that ‘renewables’ can and are effectively undercutting reliable electricity generation costs (as they have preferential treatment to supply) when they can supply, and when ‘renewables’ can not supply then all other suppliers can only recoup part of their lost revenue (to ‘renewables’) and/or put up their prices to make-up the difference. These ‘renewables’ have a low capacity value. In other words the ‘renewable’ sector exists in a ‘heads I win tails you lose’ regime and gets subsidized for it. All-in-all the customer/taxpayer will eventually have to pay for all of this stupidity. Further when the grid has a large enough percentage of ‘renewables’ nominally available it could cause a capacity value crisis, where reliable power provider will not be able to supply at a low enough cost (because their economic model is based on having a high share of required demand 24/7/365) but ‘renewables’ may not be able to supply. California is rapidly reaching this point (gas generation suppliers have gone bust), and certain areas of Australia may already be at (or passed?) that point. In both of these areas electricity cost have and will continue to ‘necessarily skyrocket’, while grid supply reliability falls. All the above from Tomo is absolutely true and we are paying through the nose for this stupidity. Quite correct and applicable to most of Australia where we have 2 sorts of politicians. The first is the dim-witted (or merely demented) who believe that renewables are the magic coach to power. The second are a minority but have some grasp of the above, but are too timid to say so. Needless to say all States and the Federal governments are dominated by the first category and all we can do is pay (and pay again) until midnight when the magic wears out. And then the UK government does understand why British power capacity auction fails to attract gas projects. What about decommissioning costs? 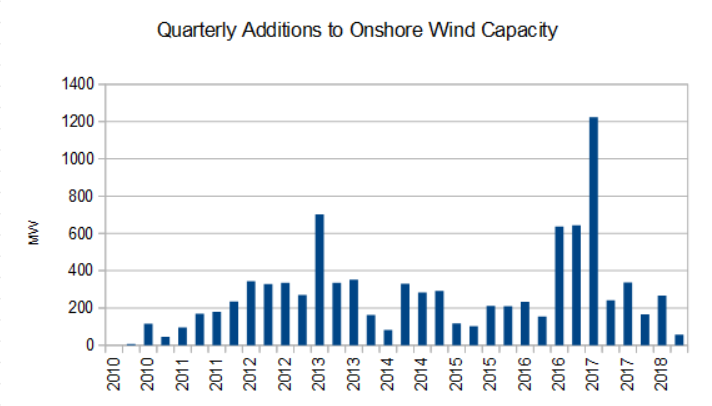 Oil cos. are not allowed to abandon defunct oil rigs so what about wind farms? Are they allowed to abandon their derelict infrastructure ? It would be a huge job to even try. How they could return any land to usefull purpose is dubious in the least. Your post of June 7th 2016 dealt with the untrue “Political science” figures used for comparison very thoroughly. The missing factor in the cost of support power is the variability and low load factor that this operates at. In my opinion, OCGTs would be far more economic that CCGTs for the low load-factor support of the unreliable-generators. CCGTs are presently about 60% efficient as against 42 % for OCGTs, but the CCGT efficiencies depend on the run time and a decent load-factor. The support generation is to match sudden dips and surges, in which mode CCGTs are suffering damage that is shortening their lives dramatically: OCGTs are probably the lowest cost approach to getting a few GW onto the grid quickly. It would be interesting to really evaluate the cost of supporting the unreliables, the £ 10 / MWh looks vastly too low if wear and tear and inefficiency of rapid response operation are included..
What is renewable about a wind turbine? They have to be repaired and replaced. Is that what renewed means? Cleaned? Repainted, dead birds removed? An energy used-car out of biofuel? I’m sick to death of hearing absolute claptrap put out by the BBC on climate change particularly on what used to be the flagship station, Radio 4. It’s now just a mouthpiece for junk science and they’re openly proud of the fact that they’ve shut down any scientific debate. It’s all reminiscent of the frightening images of books being burned in Nazi Germany with crowds cheering as the pages went up in smoke. This is a new dark age unfolding before our eyes from a corporation that is out of control. It’s not just ‘gone rogue’ on dumping scientific debate by the way. If press reports are true, it’s dodgy on other areas too … such as the imposition of questionable tax avoidance schemes on employees and its gender bias in rates of pay. Meanwhile we are forced to pay for this increasingly shabby monolithic beast through the compulsory licence fee. The science is settled, according to the BBC. Good job Roger Hasbin and Co. weren’t around when Einstein and his contemporaries challenged the assumptions upon which Newtonian physics is based. BTW, I now watch the RT evening news rather than the BBC. It seems less biased. If it were just the BBC. Unfortunately the whole education system is corrupted and is the purveyor of false science and history. Unfortunately Robert you are 100% correct – it’s sad but true. While the wondrous Ms Lucas seems to see the conservatives coming to their senses, the rest of us can see no such thing. But it does highlight her state of mind as equating to a box of frogs. Sorry frogs ! That is a bit unfair on you. How on earth can she trot out such utter b****cks ? There are other oddities in the report: round 3 offshore wind is supposed to have 48% load factor, net of availability. Seems rather high. Even onshore wind is at 32%. You are wrong. Onshore wind is the cheapest form of energy generation and developement of new projects has not stopped…. I should know as I develop them. But I might be wrong. Just tell me why they are still begging for subsidies if they are so cheap. This quote from the BBC: “These figures do account for construction costs …” is very clever. In the context of the report it seemed to me more logical to read it as “does NOT account…”. And I figure that’s what it would have said. But, when BBC get a complaint they will miraculously discover the missing NOT and say, sorry, it was a typo. In the meantime, anyone reading it will take it – literally – as read. Well, of course they never ‘run out’, they’re just so intermittent – whereas fossil fuel is not. I bet that if Lucas bought a VW that said she’d get 60 mpg and then found she only got 15 mpg she’d be first in the queue to sue VW. never run out – unlike fossil fuels — which fossil fuels exactly? USA and Russia have no trouble finding them. They never run out. But take frequent breaks. In fact, solar is on break way more than it is on. 2. Do Gas power stations pay for their transmission lines? Hinckley C is getting it’s paid for by the taxvpayer. 3. It needs subsidising because all renewables require up front investment, after that the energy is free. It’s a completely different model to fossil fuels. And why should fossil fuels pay a carbon tax. Climate change is going to cost us a fortune. 1) Gas pays for transmission costs just as all generators do. 2) Wind energy is not “free” – you, me and all bill payers will be paying the subsidy for many years to come. 3) As for “climate change”, tell me exactly what difference our fleet of CCGts will make to the climate. Transmission costs are almost entirely lumped up and dumped on consumers: there is very little for generators to pay, and certainly nothing that reflects whether their location is close to demand that is currently being met by more distant generation (thus saving transmission costs), or a long way away, thus requiring additional grid investments to make the power available where it is needed. We owe this particular idiocy to Alex Salmond, who not only persuaded OFGEM that Scottish wind farms should be subsidised by not having to pay for the added grid costs that they impose, but also persuaded the EU to enshrine the principle in EU law. Aside from the middle of sunny summer days, when solar generation in the SW UK provides a large surplus to local demand, Hinkley Point is fairly well located relative to demands and lack of alternative generators. Indeed, National Grid are using the “dump it on consumers” provisions to push for further cross Channel links from France (more nuclear power) into the SW, expanding their regulatory asset base and the profits they are allowed to make. Hinkley is a bad investment decision: not because it is nuclear, but because it is an unnecessarily costly, unproven design, bought for political reasons (trying to be nice to the French by helping to bail out Areva in the stupid hope they would be nice over Brexit – so much for that, and to the Chinese by offering them sweetheart terms (10% guaranteed!) to finance the project in return for some unstated favour). The South Koreans are nearing completion of the Barakah complex in UAE – some 5.6GW (cf 3.2GW for HP) for $24bn, using a well proven design that is much cheaper to construct because of the learning curve effect. It has suffered little delay (mainly for training of future operatives). What is clear is that wind is heavily subsidised through not only the ROC mechanism, and some very fancy CFD prices, but also because all sorts of grid investment is being made to support it. For example, the planned interconnector between Scotland and Norway will allow wind farms to dump surplus power in Norway, while apparently being subsidised up to the level of their CFD by British bill payers: the link is said to cost £1.75bn for 1.4GW of capacity that should really be charged to the wind farms, and not to bill payers. 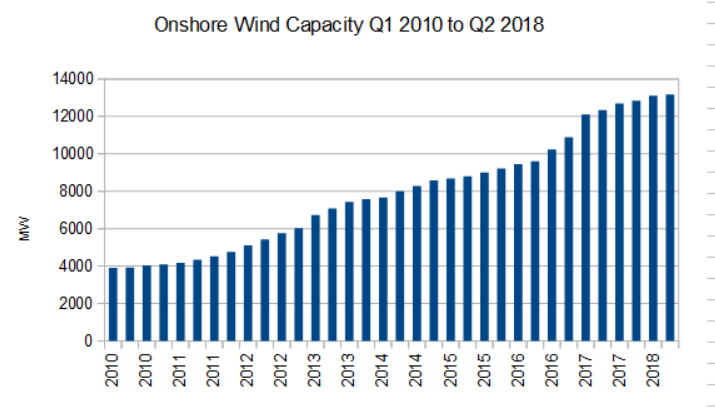 Without that dumping capacity, the wind farms would be forced to curtail output to fit in to the export capacity to England, which has just had a £1bn+ 2.2GW boost via the Western Link HVDC project – something only needed because of Scottish reliance on wind and they need backup, now they have shut Longannet which supplied power directly to the Lowlands and Glasgow and Edinburgh in particular, and aspiration to export wind. The statutory limit on charges to generators is €2.50/MWh, and the proportion of charges that go directly to demand is rising from about 86% to 90% (see Table 24). Adding injury to insult, this results in demand in Scotland being subsidised. Table 5 shows the transmission charges in p/kWh applied to domestic consumers. The SW has some of the highest tariffs because it is normally short of generating capacity relative to demand, and competing for supply on the fringe of the grid with other parts of the South that are similarly challenged. The difference is some £40-50/MWh and rising. Had the difference been imposed instead on generators, Scottish wind farms would have lost value that would have largely obliterated the value of the ROC subsidy, and therefore would never have been built. Salmond was certainly a very canny Scot. When the turbines wear out another round of subsidies will be expected for new ones, and someone will have to pay for the old ones to be demolished and got rid of. BK, lying about climate change is what costs us the fortune. The BBC was plugging a report from the Climate Change Committee this morning about rising UK sea levels threatening coastal communities blah blah blah – they are predicting 1m rise by 2100! The reality is probably about 16cm on the high side. Their predictions are nuts and detached from reality. My home town has spent millions on ugly tidal walls that are completely unnecessary, based on insane sea level rise predictions. Here you go, portraying normal coastal processes as climate change, and giving scary numbers with indefinite timescales. Total BS. Presumably it’s what the consumers pay to the suppliers – its what the generators of renewable energy have to charge for their product? So where do Renewable Energy Certificates (ROCs) fit in, for plant operating prior to 31 March 2017. They don’t apply to new plant. Is somebody (taxpayers & consumers obviously still paying 2 ROCs (just over £90 per MWh) for offshore wind and 1 ROC per MWh for onshore wind. Is that included in the BBC figures? My supplier (EON) cracked me up recently. Just ’round figures’, my estimated cost for the last 12 months was £700. Staying on the same (the cheapest) they claim tariff will cost me north of £900 for the next 12 months. Hello Mr Hammond, what were you saying about the inflation rate? When first mooted, those meters were going to cost £341 each. The current cost of them is now somewhere beyond £1,100. Why don’t they give up on the Smart Meter (saving themselves the £1,100 cost of installation) and give me a year’s supply of free electricity. £15 per year to repay an 1100 quid debt – is it me or them that’s insane? 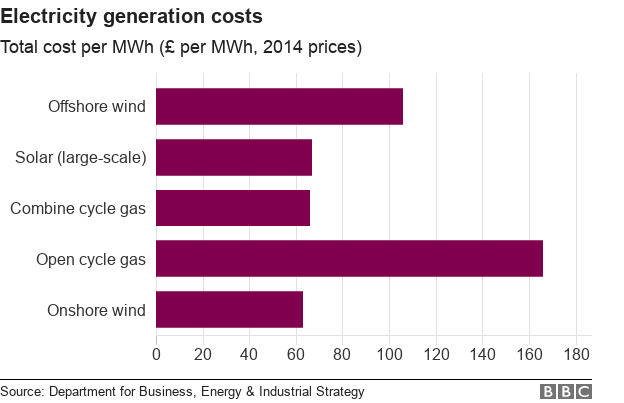 This particular BBC article refers to theoretical costs of generation, according to a recent BEIS study. The reality is that North Sea Oil has been paying billions into govt coffers over the years, on top of normal taxes. You would probably have to go back to days of the nationalised coal industry to find genuine subsidies, and they were not subsidies for fossil fuels as such, but subsidies for nationalised industries which were widespread in those days. But stick around , and you might enlighten yourself! Two things that no longer go together. 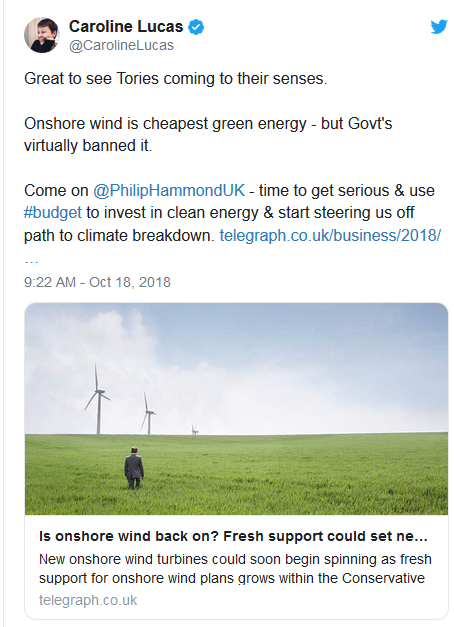 I think the writer is overlooking the big issue with onshore wind is the uk government is blocking its route to market. In Scotland where the government here want onshore wind it is the blocking the route to market that is the problem. As for subsidies. The uk government is guaranteeing a market for very expensive nuclear effectively blocking other cheaper sources like onshore wind fulfilling that demand. And does it make sense to subsidise higher cost offshore and guaranteeing a market for that produce therefore effectively blocking cheaper onshore. Perhaps you should have a chat with Carla Ribeira (comments above) who assures me that her company is still busy building them,! We don’t control the climate – it controls us! How true and how arrogant of us to think that with our piddly little wind turbines and solar panels we are going to make one scrap of difference. We cannot manage to carry on with our day to day stuff in the face of volcano eruptions, earthquakes and storms now and these pale into insignificance compared to the effects of climate warming that the pointless IPCC say are coming. Was ever a man more inappropriately named ? Harrabin. Horrorbin! That surely is where he should be destined. The manager is an anti-Conservative activist. A sheikh is not going to sit on a field of gas and not sell it. .. Plus Granny as a taxpayer , pays for extra costs of wind subsidies/transmission-infrastructure/network inefficiencies as those costs are added to the cost of electricity and therefore everything she pays for. Every time new wind or solar are connected to the grid Granny gets poorer. You say that “The BEIS shows quite clearly that intermittency costs are not included in their costings.“. Where does it do that? So far as I can see, the only reference to intermittency is this (top of page 13): “The load factors for wind, solar photovoltaic (PV) and marine technologies reflect that they operate as intermittent electricity generation technologies.” – which would seem to support the BBC’s claim. Or have I misunderstood what that means? Your comment that the “carbon cost” applied to CCGT is “totally artificial” is unlikely to get anywhere in debate with a Green who would probably argue that, in view of the damage done by GHG emissions, £19/MWh is insufficient. The report is full of what the authors keep noting is highly uncertain spreadsheet outputs with dubious input data and sensitivity analyses. The assumptions seem to be set to generate the desired model outputs, just like the global warming models do so cleverly! The CCGT efficiency is set at 54%, while over 62% has been achieved for the last few years. For OCGTs the assessment seems to be based on using heavy duty gas turbines in open cycle mode, while aero-derivatives are far more efficient and better suited to OCGT operation: efficiencies of about 42% are easily achievable. This “correction” of course makes the diesel generation look poorer and the case for CCGTs even better. The lack of mention of intermittency costs and penalties is further evidence that the reports objectives are to support the pre-determined opinions of the sponsors and justify their actions. Thanks Jack. But Paul’s observations are usually very precise. He doesn’t say that intermittency cost are not mentioned but that “The BEIS shows quite clearly that intermittency costs are not included in their costings“. I would find it useful to see where it shows this and why the BEIS statement that ““The load factors for wind, solar photovoltaic (PV) and marine technologies reflect that they operate as intermittent electricity generation technologies.” do not support the BBC’s claim. Thanks Paul. I suppose that, if “the full cost of system balancing” includes intermittency costs, then they are not included in the BEIS costings. But it’s far from clear – especially in view of the statement that “The load factors for wind, solar … reflect that they operate as intermittent electricity generation technologies“. I suggest that, in this case, it may be over-harsh to accuse the BBC of “lazy, slovenly writing“. you say “damage done by GHG emissions”. Do you know what these damages are and whether they are observed or based on someone’s hypothetical predictive model? As I said, it’s something “a Green who would probably argue“. So ask a Green, not me. An incredible article is in today’s “I” by their resident harobin, Tom Bawden. Having said that onshore wind power is the best thing since sliced bread and produces by far the lowest cost electricity, he says that the previous subsidies must be provided to save us more money. Apparently, subsidising wind power again will save us £ 1.6b over 15 years. Since when did successful businesses need subsidy to make a profit: you could not make it up ……. but the eco-nuts can!